Goat cheese is a many splendored thing. Yes, we recognized we changed out the words “goat cheese” for the word “love” in the previous phrase. Can you blame us? Goat cheese is a love-it-or-hate-it food. For the purposes of this post, let’s pretend we all love it. And when we love a food, sometimes we go overboard with it, such as the five ways we recently used goat cheese. 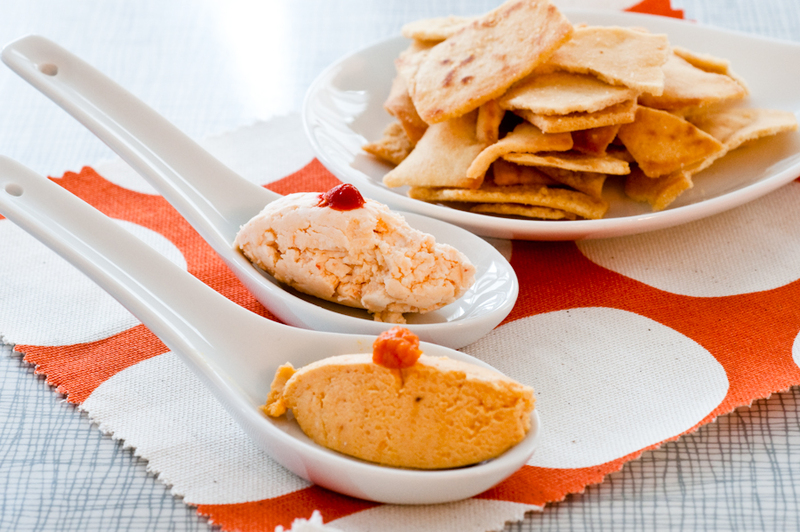 Sriracha Goat Cheese – Add Sriracha to goat cheese and serve with pita chips. Your amazing spread just got amazing-er – and zestier, too! If you’re unsure about guests’ tolerance for heat, err on the side of caution. You can always add more Sriracha later. You can add sweet foods, such as canned pumpkin to goat cheese for variety, too. Goat Cheese & Noodles – Toss goat cheese bits with buttered noodles. Add some sundried tomatoes (we adore the ones from Trader Joe’s for $3.29/jar) and protein if you have it on hand. Instant deliciousness! Goat Cheese & Guava Bocaditos – Serve to guests on a small, sweet cracker with a slice of guava paste. Goat & Blue Cheese Crackers – Replace a small amount of blue cheese with firm goat cheese (not soft; it has too much water for this recipe) in this incredible cracker recipe from our friend Cecilia at One Vanilla Bean. These crackers will seriously blow your mind. All-Purpose Topping – On a salad with pecans and pears or on a pizza with pepperoni and sweet peppers, soft goat cheese is a creamy complement to the meal. In case you need another reason to partake, here’s more good news: goat cheese is lower in fat and calories than cheese from cow’s milk. Goat cheese also contains protein, calcium and several B vitamins. The low-fat craze of the 80’s left us missing out on the flavor and satisfaction that fat provides. Besides, cheese is usually paired with other items, therefore offering a variety of nutrients. Two thumbs up for cheese in moderation! Do you love goat cheese? Great! Hate it? Well, haters gonna hate, but please don’t rain on our parade. How do you use goat cheese? Goat cheese rolled in chopped, toasted Marcona almonds with honey drizzled (or poured) on top. Best. Appetizer. Ever. Robin – That sounds fantastic. Never would’ve thought to add the honey. Might even serve that on Sunday when I have brunch guests! Robin – Marcona almonds & goat cheese? Be still my heart. Thanks for the fab idea. Olga – I’d love to hear more about the ice cream, too. Stacy and Sam-it is amazing.. hope you love it as much as I do!